What are growth appliances? 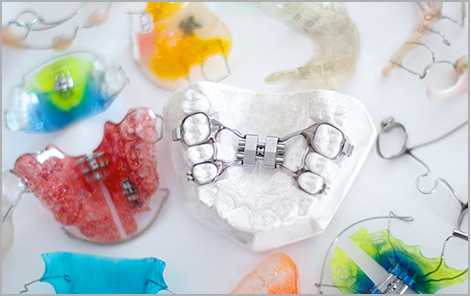 Jaw growth appliances treat patients that require orthopedic correction of their jaw bones. In other words, they are used when there is a need to improve the growth of a child’s upper and/or lower jaw. They stimulate and guide jaw growth to a new position, and also train the jaw muscles to function in this new position. These appliances can be used during a specific window of time during the growth of your child. That is why it is so important to have an early consultation (see Early Treatment Section for more details) to be able to treat within that window of opportunity. Your Toronto orthodontists, Dr. Pablo Kimos and Dr. Willy Dayan may prescribe the use of a growth appliance to assist in balanced growth of your child’s face. Jaw Growth appliances consist of different designs of bite plates or headgears that are used when there is a specific need to improve the growth of your upper or lower jaws. They work by stimulating the jaws to grow into the new desired position, while also training the jaw muscles to function in this new position. Removable bite plates can take a bit to get used to at first, and there will be a brief period of adjusting to your new plate. Your speech may sound different initially, but soon enough you will be able to speak clearly without any issues. Brush your plate with toothpaste each time you brush your teeth in order to avoid bacterial growth on your appliance. It is very important you wear your plate correctly by first moving your jaw into position and closing completely, then putting your lips together. It may help to practice talking and smiling in front of a mirror with your plate in. Brush your plate with toothpaste each time you brush your teeth in order to avoid bacterial growth on your appliance. Do not wrap it in napkins while eating. Others may think is garbage and throw it out. Do not place it on fast food trays also to avoid being thrown out. If you have pets at home, keep it beyond the reach of dogs as they get drawn by the saliva smell and chew on it. Keep your bite plate in its case while you are not wearing it. Wear your plate correctly by first moving your jaw into position and closing completely, then putting your lips together. It may help to practice talking and smiling in front of a mirror with your plate in. Wear your appliance exactly as instructed by your orthodontist to obtain adequate results and prevent delaying your treatment. When you handle the plate be careful not to bend the wires. When the plate is removed from your mouth, place it in the case provided. To avoid losing your growth appliance, refrain from leaving it on the counter/table or wrapping it in a napkin. Appliances may be mistaken for trash and discarded. If you lose or break your growth appliance, contact your GTA orthodontist immediately to schedule an appointment. Soreness 12 to 24 hours after wearing your bite plate is normal, and this can last anywhere from 1-4 days until your mouth has adjusted to the new appliance. Palatal expanders are another type of growth appliance that is used to fix a variety of issues including: narrow of constricted upper jaw, teeth blocked from coming into the mouth, dental crossbites, and more. There are different types of expanders. Some are fixed to your teeth and some are removable. When you first receive a fixed palatal expander, it will be adhered to 2 or 4 of your teeth on the upper jaw or palate. The palatal expander works by gradually widening the upper jaw to correct the issues mentioned above. Palatal expanders work on the growth suture in the middle of the palate stimulating the jaw to become wider. This type of growth appliance is usually used on growing children. At some point the growth suture in the middle of the palate fuses with bone so an expander is no longer effective which is why City Orthodontics recommends the first consultation at age 7. The process of creating a palatal expander includes taking an impression of your child’s teeth, cementing the expander to the back molars, and then adjusting the expander with the help of a parent or guardian on a consistent basis. We will properly train the parent/guardian on how to adjust the expander at home. Patients usually take about 3-5 days to become accustomed to their new expanders. Much like bite plates, talking and eating may be uncomfortable at first, but once adjusted it will become second nature for your child. Your child should brush their expander each time they brush their teeth. Your child should be brushing an average of 3 times a day, or anytime after you finish a meal. Food and debris can become lodged in the expander, and it is important to use a water syringe to flush out the debris to avoid build up or infection. We will provide you with an oral hygiene kit to make cleaning the expander much easier. Avoid eating hard and sticky foods when using a palatal expander. These types of foods can become lodged in your teeth/expander, and can become difficult to remove and/or cause damage to your appliance. Additionally, avoid playing with your palatal expander using your fingers or tongue. If a wire begins to bend, or if a band becomes loose, please call our office as soon as possible. We appreciate you taking the time to learn more about the growth appliances offered at City Orthodontics. If you would like to schedule and an appointment or have any further questions about growth appliances, contact us at (416) 222-3223 and one of our highly skilled staff members will gladly assist you. We look forward to seeing you in our office soon!